LOVE it! I wish I had some honey stix for me, LOL. Can you tell me where I could buy some cute skewers or picks online? Yummy lunch! We still call them playdates lol. Honey sticks are amazing! We have a local farm that makes honey and sells those. So tasty! Found you from Just A Girl...so glad I did! I am always looking for new lunch ideas. Can't wait to order some picks and other fun stuff. Hi Accountant! :) Unless you are in an area where there are bento type shops the best online places I've used myself are Jlist.com/Jbox.com (there's a ad for them on my sidebar) and there's also good 'ol ebay (search for "bento picks" and "bento forks"). There are a couple sets on Amazon (Wilton fun pix, animal forks)(both are shown in my Amazon shop), but the pickings are slim for picks there thus far! Yum! I love honey sticks! I hadn't ever thought of honey sticks for the kids, I bet thy would love them! I'm planning on hitting the farmer's market tonight, I am sure I'll find some. Thanks for the idea! This is just SO pretty! It reminds me of the gift packs they sell at the holidays for girls with makeup or nail polish or whatever. The product (makeup, or in this case - food!) of course is good, but it's irresistable in the way it comes packaged. What a gift this one is Melissa!!! Love the delicately wrapped granola bar. We got honey sticks at the farmer's market last year. They are SO good. I need to go look at your granola bar recipe. I've been wanting to do that. The cheese stars are SO CUTE! And the homemade granola bars sounds yummy! Thank you for joining my community. I'm following you, too! My sister-in-law emailed me your blog address, and I've been visiting ever since!! I love looking at all the pretty pics and ideas. I want to do this too! 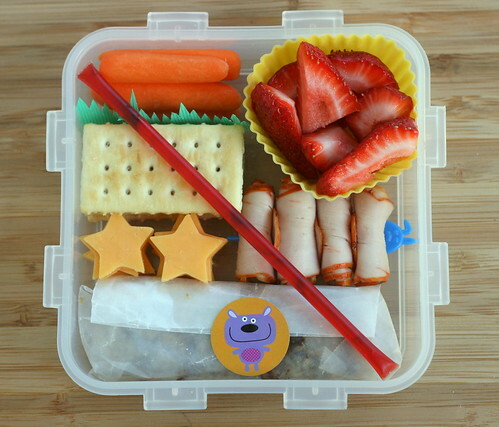 It looks like a lot of fun and a great way to get kiddos excited to eat a variety of healthy foods. Today I used cookie cutters on sandwiches for my girls and they loved them! Thanks. Where do you get the small square boxes that fit so perfectly in a group of 4 in the lock-n-lock boxes? Just a quick question - do you use cookie cutters to make the cheese cut outs? And do you just use a regular slab of cheese? They look so perfect and even - like store-bought! Cass, I do use small cookie cutters for the cheese. We buy cheese in huge blocks and slice it ourselves. Once in awile we'll get a block that seems on the dry and crumbly side and that doesn't make for easy (or neat) cut-outs, but most of the time the cheese cuts perfectly with the little cookie cutters!